Strip out unneeded languages. Safari is available in more than a dozen languages, Adium in more than 20. This is great, but how many of those do you need? Xslimmer allows you to select how many languages you want to preserve in your apps and will remove the rest, recovering lots of precious free space from your disk. Remove unnecessary code from fat binaries. Xslimmer determines which code your machine needs and removes the rest. This is achieved by removing the code inside the Universal Binaries that does not fit with your machine's architecture, a code that never gets executed and just wastes your disk space. 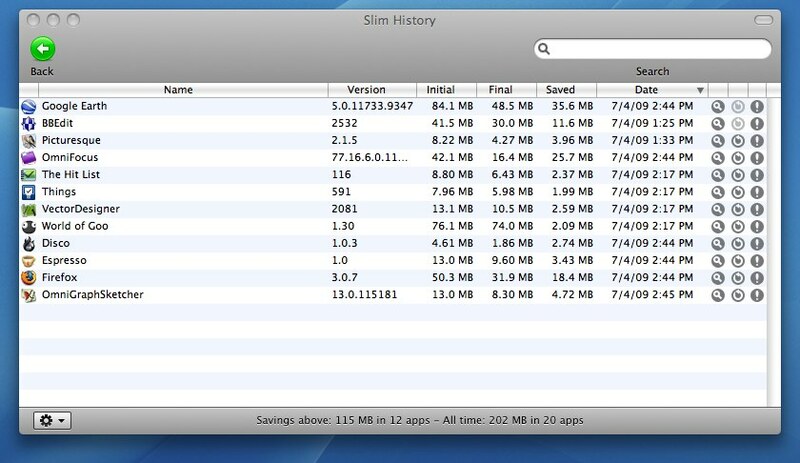 Xslimmer not only frees space wasted by unused code, it can even increase your Mac's performance. Some of our users have reported applications loading in almost half the time, because OS X does not need to analyze Xslimmed applications in search for the most suitable version of the code. See for yourself! Grab your copy of Xslimmer now and try it out for free until you free up to 50Mb. Slim what you want, the way you want it. Take out languages, architectures or both. Select which languages to keep, and let Xslimmer take care of the rest. Checkout Xslimmer's extensive preferences and configure its behavior the way you like it. Xslimmer understands and respects the relevant underlying technologies under Mac OS X, including file system compression, or Universal Binaries made up of 32-bit and 64-bit code versions. Use the familiar drag & drop interface to add the apps you want to slim, or have the Genie find all the apps in your system for you - you may be surprised how many are installed! All found apps will be added as if you had dragged them in, so you can review them before slimming. Know what you did, when and how much you saved for every application you slimmed down, and if something went wrong with one of those apps, you can restore the situation to its original state and report the app to us, so we can add it to the blacklist! 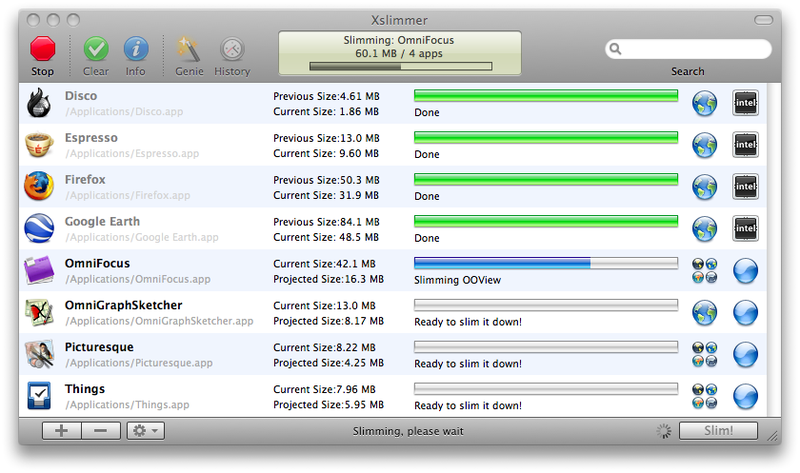 Display extra info before slimming your apps, to learn all details about how Xslimmer will modify your application. Gain confidence by being warned in advance about side-effects, such as the need to reauthorize access to the Keychain. To avoid unnecessary headaches Xslimmer uses a downloadable blacklist, which tracks apps that do not allow themselves to be modified - to prevent piracy, usually. Blacklisted apps will be ignored, and the list will be automatically updated as new troublesome apps are discovered. Have Xslimmer save a copy of your originals for you, and let it delete old backups periodically so that you don't have to remember about them. Restore your app quickly if you suspect it does not work correctly after being slimmed down. Trying out lots of new apps? Save time, space and simplify your workflow having Xslimmer install your apps already stripped of all the unnecessary bloat. Simply drop the app from your .dmg image to Xslimmer's icon to have it slimmed down and installed into your Applications folder. Have your apps load in less time by reducing their code size! 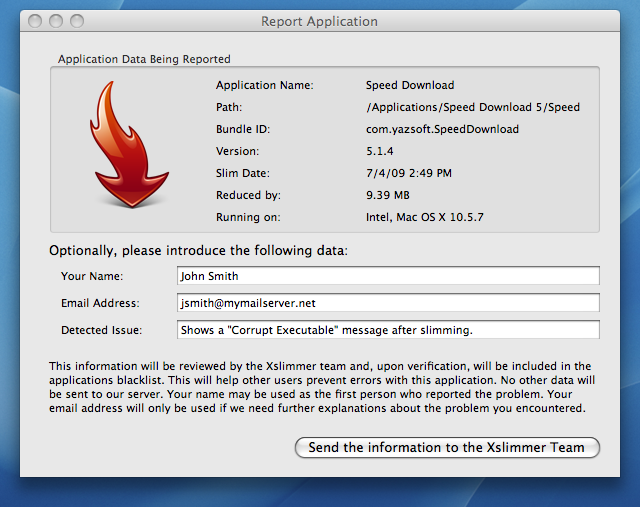 Xslimmer will preserve the binary version that is most suitable for your computer, therefore Mac OS X will not have to check what version to run every time you launch an app. Backups, downloadable blacklist, user-configurable paths to exclude, detailed info and total control of the process: Xslimmer adopts every measure to gain your trust - and facilitate recovery in case something does go wrong. Use Xslimmer even in older computers, where disk space is absolutely precious! 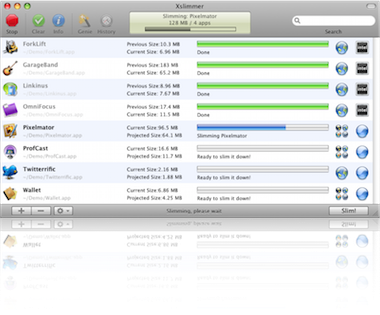 Xslimmer is compatible all the way from Mac OS X 10.6 (Snow Leopard) through 10.7 (Lion), 10.8 (Mountain Lion) to 10.9 (Mavericks). Legacy versions are also available for systems running 10.4 or 10.5. Available in English, Spanish and many more!. 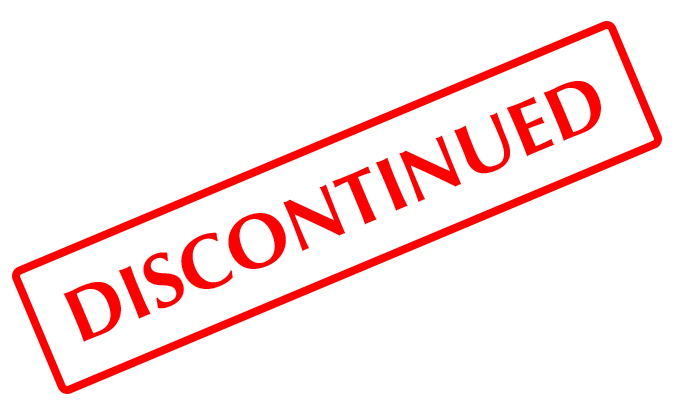 Xslimmer has been discontinued and it is no longer available for sale. "Wow, great app. As an example, iTunes went from 114Mb to 32.4Mb....and that's just one app"
"Very easy to use app, a must-have for Mac owners. Highly recommend it!"